There are some Chrons people who should be reading and commenting on this novel. I am hoping it will be nominated for the Mythopoeic Society's fiction award. A Russian philologist has written a book that is a masterpiece by any standards. It has already been published in twenty languages, attracting international attention. 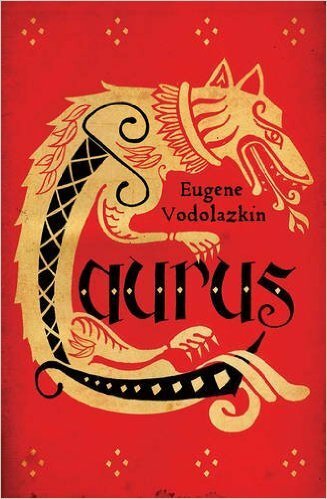 First published in Russian in 2013, Eugene Vodolazkin's Laurus became an instant national success winning several of the most prestigious Russian literary awards, among them the National Big Book Award and Yasnaya Polyana Book Award. n the dusk of his life, Laurus returns to Kirillo-Belezorsky Monastery where he came from. The ending is chilling, repulsive and unexpected. Vodolazkin pushes us back into the medieval reality of the novel, the religious mystery and an unequivocal world of ugly holiness which we believe we have navigated a long way from - but have we? As Zachar Prileptin said before me, I am simply filled with an unending sense of happiness that such a novel exists. You open it and close it, something has happened to your soul. If I were to put Laurus into the hands of a few famous science fiction and fantasy writers, urge them to read it, and ask them what they thought, I'd like to put the book into the hands of Ursula Le Guin and Jack Vance. I thought of the latter when a group of Franciscans supply a pilgrim with a donkey and tell him, "This animal will keep you humble. He has an attitude, and that explains, to a certain degree, our desire to part with him." I'm looking forward to seeing the TLS review of Laurus. Well, that's cool: looks like Allen and Unwin, Tolkien's publisher, are distributing Laurus in the U. K.
I'm not sure their description of the book is 100% accurate, but I do love the book. tells a little about recognition of Laurus and also gives glimpses that I haven't seen elsewhere of other works by this author. Thank you for bringing this to the attention of Chrons. I was not aware of this book or its author but I'll certainly be acquiring a copy. Boris Dralyuk has given Laurus a very favorable review in a recent TLS (8 Jan. 2016), but the review doesn't appear to be available online for free. He starts by talking about his turning to folklore and medieval studies, during the Soviet period, as a sort of "inner emigration," but not just escapism (which he pronounces like es-ca-PISM). I thought of what Vodolazkin said about "inner emigration" just now when I read this passage from Colin Wilson's generally not very good novel The Philosopher's Stone -- I liked this on page 128, where a character goes for a walk on a grey Christmas morning in the English countryside: "Even the greyness of the sky seemed inexpressibly beautiful, as if it were a benediction. I was cottages across the fields with smoke rising from their chimneys, and heard the distant hoot of a train. Then I was suddenly aware that all over England, at this moment, kitchens were full of the smell of baked potatoes and stuffing and turkey, and pubs were full of men drinking unaccustomed spirits and feeling glad that life occasionally declares a truce. [Then he thinks of the barrenness of the other planets] And here we have trees and grass and rivers, and frost on cold mornings and dew on hots ones. And meanwhile, we live in a dirty, narrow claustrophobic life-world, arguing about politics and sexual freedom and the race problem." Laurus will help some readers to get out of that horrible rut in which one experiences life as being about "politics and sexual freedom and the race problem," endlessly agitated about in English classrooms, college quads, television programs, Davos, etc. or are readynot to be impressed by it, give Laurus a try. I've seen Laurus reviewed favourably here in the UK and made a note of it - I think in the Financial Times weekend Arts section. They have a paywall or I would try and find a link. Think the review compared it to Umberto Eco - does that sound a good comparison, or is it just that both use Medieval settings? Eco's Name of the Rose is one of my favourite books, although I don't like his others (those I've tried anyway). aThenian, I read The Name of the Rose 30 or more years ago, and don't remember it well enough to say whether a comparison between it and Laurus is appropriate. Off-hand, my impression is that they are not very much alike. Maybe the reviewer also made the comparison because both writers are academics? I think Name of the Rose benefited from being a 'mystery', which gave a strong narrative framework to some very erudite material. The other novels by Eco that I have tried have seemed to have the erudition, but been a bit of a mess...at least, I certainly got bogged down by them. I'm intrigued by Laurus. It sounds like a book to love or hate...either it's going to work for a reader or it's going to leave them cold. I'm reading Laurus for the second time and possibly enjoying it more this time around, but I don't want to post notes into the void. I'm a little afraid that this book is going to miss being nominated for awards (e.g. Mythopoeic Society) because it comes from a little-known publisher (OneWorld) and has an unfamiliar setting (medieval Russia) and an unknown author. By the time enough people have read it for it to have a good chance, the deadline for award nominations may have passed. Not a big deal in a way, but I'm rooting for it. ...Wish I had someone I could root for, for the U. S. presidency! I'm a member of the Mythopoeic Society and that sufficed for eligibility to nominate Laurus for the adult fiction award, so I have done so. I've been a member off and on for over 40 years, and this is my first nomination. I hope this book wins! It's fitting that the Australian edition of Laurus is published by Tolkien's publisher, Allen and Unwin. Decided to get me a free kindle sample of this. Evgeny Vodolazkin is a new genius and his new book is a true masterpiece. It is needless to say for the ones who are familiar with this author, as he is known as an outstanding storyteller, keeping reader’s attention from cover to cover, bringing up unusual plots, Interesting characters, describing the most interesting historic layers of the Russian history and using most vivid language of the true writer. His books are highly spiritual and thought provoking, that bring the reader to a lot of philosophical questions about life, God and the place of a single person in the world history. His book “Aviator” is about one of the darkest period of the Russian history covering last century period, starting from the first days of the 19th century and ending the last days of it, covering the period of the revolution, bolshevism, neo-bolshevism, Gulag, war and anarchy. The events are presented in the form of mental chronicles and memoirs, and written diaries of 3 different people, belonging to 3 different generations of the last century, who by whimsical and mysterious turns of the destiny found themselves in one boat, called life. Written in the form of historical mysticism or mystical historism, the writer, piece by piece, like a skillful mosaic artist using little pieces of glass, creates the detailed picture of Russia and its people. I don’t want to describe the plot, though itself it is very unusual and close to science fiction, but I want to say some words about the way he is presenting this unusual story, which is unknown in literature and could be a beginning of the new way of writing. The most vivid description of it would be, if you imagine that a very sensitive and talented painting artist would somehow become the owner of the paints that have not only touch and texture and can make beautiful colors and natural forms but would have also the sound and smell and vibes , and light, and energy, and even more, like the sixth sense, and this talented artist would manage to master this paints in all its fluidity with styles and times. Evgeny Vodolazking is pictured to me such an artist whose magic paints are words. He is a new generation writer who is trying to involve all our senses, creating a true holographic picture similar to virtual reality, in which you are an observer and participant at the same time. And not only that, he is presenting several virtual realities through the souls of different characters that at one point come together and in focus with the most important subject – life. The events go around the first commandments – “do not kill”. Looking forward to see it published in the English translating to read it to my husband. Here's a new essay. "The Age of Concentration," by Vodolazkin. It includes a link to an earlier essay.